12/17/2008Share this story on Facebook! Every semester, a club called the Core Trading Consultants sponsors the Investment Challenge, a semester-long competition in which students of any major try to turn $100,000 in virtual money into virtual millions using actual market data. Students get real-time quotes and, using that information, submit a trading form to take part in the virtual stock exchange. Throughout the semester, students track their investments in the trading room using an interactive portfolio and investment tools such as Thomson One and MarketLink, Wall Street applications that allow them to view their changing gains and losses and research stock information. At the end of each semester an awards ceremony is held to honor the three top performers and top performing first-year student. The prizes are shares in a mutual fund called the Ithaca College Investment Club, which has more than $25,000 in real assets. The Virtual Stock Exchange is a free stock market game from MarketWatch. 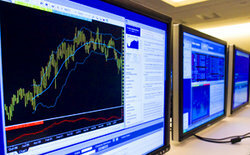 Ithaca College students use it to place trades in the Investment Challenge. Consider a major in business. While stock market crashes and problems on Wall Street have created a great deal of uncertainty in the world of finance, Ithaca College’s business programs continue to run strong. With extraordinary faculty, new state-of-the-art facilities, and a nationally renowned sustainability initiative, students now more than ever appreciate the operations of the Dorothy D. and Roy H. Park Center for Business and Sustainable Enterprise, which houses the School of Business. Business majors also appreciate the dedication of faculty like Abraham Mulugetta, professor of finance and international business. Professor Mulugetta joined Ithaca’s faculty in 1984. His devotion to teaching, trading, researching, and inspiring has only strengthened over the years, and his students have benefited tremendously from his commitment and enthusiasm. Originally from Ethiopia, Professor Mulugetta came to the United States for many reasons -- among them, freedom. “You learn what freedom really means,” he explains, “coming from a place where people cannot speak out.” Freedom is paramount in business, where having the ability to make decisions and take risks is essential. Professor Mulugetta emphasizes these opportunities for his students through real-world examples and experiences. Professor Mulgetta conducts a class in the trading room. For example, this semester Professor Mulugetta gave his classes $1 million in virtual funds to invest in the stock market. 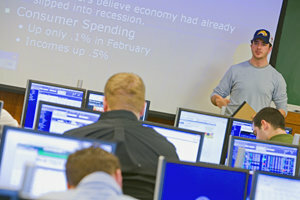 Working in the Center for Trading and Analysis of Financial Instruments -- IC’s real-time trading room that Mulugetta spent four years planning and designing -- students simulate the buying and selling of stock using some of the same software used on Wall Street. 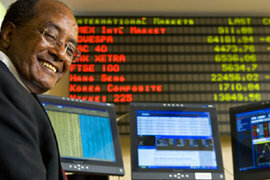 Mulugetta has been directing the trading room since 1994. Recently reopened in the school’s new building, the current room has the largest number of workstations of any comparable undergraduate trading room in the United States. A student makes a presentation in Professor Mulugetta's class. “The trading room reflects my commitment to IC,” Mulugetta says. 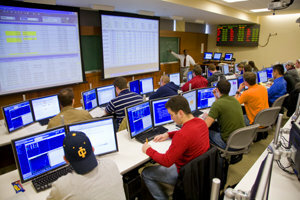 “We have created an environment where students can interact with each other, and we’ve created a very conducive atmosphere for students to challenge themselves and learn from each other.” He emphasizes that despite his role in directing the trading room, the students themselves are the ones who manage it and reap its benefits. Professor Mulugetta’s experience in the business world extends far beyond teaching. He worked for both the minister of finance and the minister of housing in Ethiopia and served as the deputy general manager for Ethiopian workers with disabilities. He also worked as a small business adviser in Wisconsin, where he earned a master’s degree in finance and international business and a doctorate in business at the University of Wisconsin-Madison. Even with these advanced degrees, Professor Mulugetta is still adding to his knowledge base. He is constantly studying, writing, and conducting finance research. His findings have been published in dozens of scholarly business journals, books, and cases. In fact, he estimates that at least 25 percent of his time is devoted to research. Over the years he has studied topics such as risk management, Internet banking, exchange rates, and currency crises to name a few, and he frequently conducts research with his students. A recent collaborative research project on the derivatives of risk management in the banking industry will soon be published in the Journal of Banking and Finance. Professor Mulugetta spends a great deal of his free time trading. Students can find him following the hourly activities of the stock market in his office. When asked what led him to begin teaching, Professor Mulugetta cites his own thirst for knowledge. “I was brought up to be curious, which was confined in Ethiopia. I like to satisfy my own curiosity, which I do by teaching and explaining. I also learn a lot from my students -- the energy level of young people is amazing.” Professor Mulugetta's students would likely say that he has no trouble keeping pace.